Find out what you need for 4K. "Assassin's Creed 3 system requirements" isn't something I thought I'd ever have to type again, but here we are, six years later, waiting for the imminent launch of Assassin's Creed 3 Remastered. It's due out in a week, so here's what you'll need to run revolutionary America in 4K. Not too high for 4K, and not surprisingly it's quite a bit lower than Odyssey's 4K requirements, which recommends a GTX 1080. We'll need to wait until launch to see what we need to get a higher frame rate. 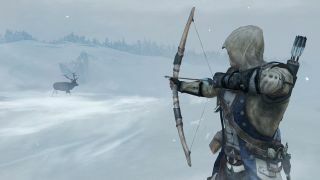 As well as a visual upgrade, Assassin's Creed 3 Remastered also changes how you fire arrows, adds more stealth options and throws double assassinations in for fun. There are quite a few changes. It's due out on March 29, and you'll receive it automatically if you have the Assassin's Creed Odyssey season pass.